The majority of us are so busy typing away at our desks, analysing our company’s Twitter feed and reading through reams of information that we can quickly succumb to a blinkered business perspective. However, the world keeps spinning, and external factors such as new legal policies or the latest technology can rise up and pounce on businesses from every angle. To avoid being consumed by the internal affairs of your business and to become more in tune and aware of external factors, try the PESTLE Analysis technique. The PESTLE Analysis should be used to provide a context for your business’ role in relation to external factors. It covers Political, Economic, Social, Technological, Legal and Environmental factors. 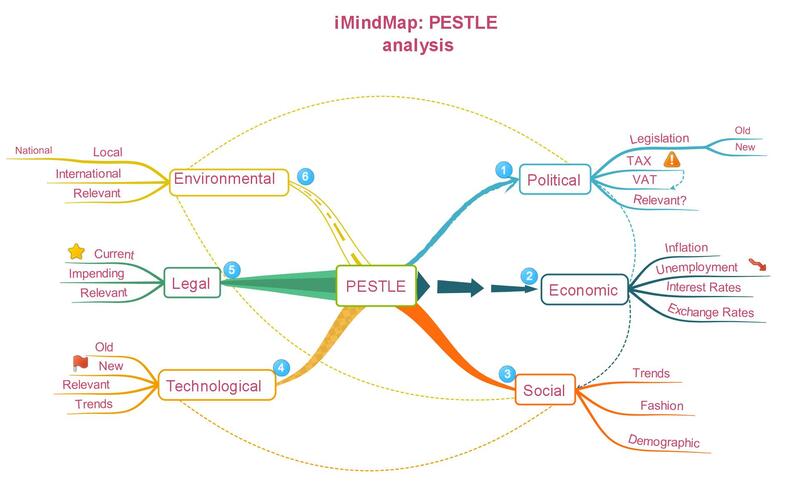 Mind Mapping is the perfect tool for the PESTLE Analysis technique because you can capture so much information on one page without losing a clear structure. Mind Mapping massively reduces the time needed to prepare and structure work, and gives you a whole picture view at all times. The importance of each category will vary from business to business. However, the PESTLE Analysis remains a proven technique that can help, and in some cases save your business from any nasty external surprises. A PESTLE Analysis will help you uncover the facts that can impact your business. The Political factors to research should include new legislation, such as the national minimum wage and tax rates such as VAT or Corporation Tax. Political factors are changing constantly. For example, if a new government is elected, this may affect the amount of tax your business has to pay. Businesses often rely on crunching numbers because it gives them a feeling of control over their future. However, by looking at the ‘big picture’ and taking the external factors into consideration, you can manage your business economy accurately. External Economic factors that affect businesses are inflation, unemployment, interest rates and exchange rates. Having the external Economic factors mapped out could enable you to predict future economic trends – for example, a predicted recession would prevent your business from increasing the workforce. *Useful hint: iMindMap works with all of the most-used desktop tools, so you can easily convert your Mind Maps into a range of other formats, such as a spreadsheet to calculate your monthly budget, PowerPoint, Text Document, PDF and more. You can even turn your Mind Maps into tasks when you sync to visual task management app, DropTask. Social-cultural factors are variable and subject to constant change. Nevertheless, they can have a huge impact on the performance of your business. Social factors to analyse are trends in technology, fashion, food, education, religion and politics. With the development of social media, tracking social trends is easier now, in contrast to previous years. It is also important to be aware of the demographic factors that can affect your business. For example, if you are a business that manufactures car seats for babies and toddlers and demographic data shows that a baby boom has recently hit your local area – you can prepare for an increase in demand for your product. With huge technological advances sweeping across the globe, you need to be in the know regarding what technology is new, and how it is affecting both business and consumer markets. New and innovative technologies can provide opportunities for businesses to incorporate new breakthroughs and inventions to cut costs and develop new projects. Mind Maps can provide succinct subject overviews that can make even the most complex factors easy to understand. So even if you are a self-confessed technophobe, Mind Mapping will make the most complex technological gismo comprehensible. The dangers of crippling litigation should be a top priority. Legal errors can often take you by surprise and damage your company’s bottom line. Alternatively, many government laws are there for your protection, so whatever way you look at it, staying on top of your legal obligations is in your interest. Legal factors can include health and safety, equal opportunities, consumer laws and much more depending on your business. Businesses need to be in the know regarding what is and what is not legal in order to function successfully. If your business trades globally, the legalities can become complicated as every country has its own laws. The external environmental and ecological factors refer to climate, global warming and weather. Becoming more ecologically friendly is a hot topic at the moment, and governments are clamping down on multinationals who exploit the environment with heavy fines and restrictions. Considering your businesses environmental impact could enable you to restructure your business and could potentially lead to you becoming more efficient and a more ‘green’ business. This versatile technique is already used by over 250 million people worldwide for a variety of tasks including brainstorming, identifying new opportunities, organising, managing projects, teaching, studying, communicating information and much more. If you are fascinated by the Mind Mapping technique and feel ready to master one of the most valuable productivity skills of the 21st Century, become an Official Mind Map Coach or a ThinkBuzan Licensed Instructor in Mind Mapping. These 2 day and 4 day courses are certified and endorsed by the inventor of Mind Maps; Tony Buzan. Please visit our website to find out when and where the next Official Mind Map Coach 2 day course and 4 day ThinkBuzan Licensed Instructor Course in Mind Mapping are taking place.